Registrations are open for the 26th World Association of Left Handed Golfers Championship. 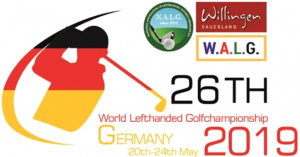 The event will be hosted by the National Association of Left Handed Golfers, Germany and will be held in Willingen from Monday May 20th to Friday May 24th 2019. More about our hosts, the tournament details and registration information can be found here. The Committee for the World Association of Left Handed Golfers look forward to seeing you in Germany in May 2019. © World Association of Left Handed Golfers (W.A.L.G.) . All Rights Reserved.